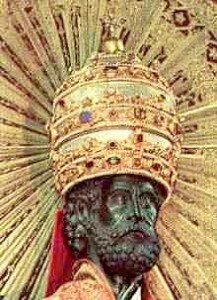 The statue of St. Peter the first, and perhaps the last, pope named Peter before the end of days. A popular Protestant conspiracy from the 17th century and later conjured up again in the 19th by the Seventh Day Adventists presumed the Papal Tiara had a Latin inscription taken from the Donation of Constantine. Add the numerical equivalent of Latin letters and reach a sum of 666. Other conspiracy theories have 666 emblazoned on papal miters or tiaras as an abbreviation of Julius Caesar's Latin inscription Vini (Veni), Vidi, Vinci – "I came, I saw, I conquered" -- in the Roman numerals VI VI VI (666). Thus, the Beast of Revelation is a future pope, some believe. This conspiracy theory was soundly debunked in the 20th century. I will write about it in detail in the future. For today's blog, I mention it only because Nostradamus seems to apply hints to the "pope-as-antichrist" in these prophecies using another lead. Quatrain 66 of Century 6 has Catholic prophet Nostradamus using the number of the Beast in Revelation to tie the discovery of a great Roman’s tomb with either an earthquake as a metaphor for religious upheaval or literally he implies a tomb uncovered around the time of a natural disaster and/or quake. In both possible interpretations, the Church is undergoing an apostasy: the opening stage of undermined faith in laity and leadership alike expected in the Catholic version of the Apocalypse. I disseminated in great detail the thrust of collected visions of the Apostasy, Roman Catholic Apocalypse and visions of a subsequent Age of the Holy Spirit beyond the need of churches here: see Apostasy. The latter prophecies either speak of a completely new world religion or a new renaissance of what it is to be universal happens after the Catholic Apocalypse — what the Greek word Katholicós means. Nostradamus’ prophecies imply that the embrace of a larger universal understanding of God and existence transpires sometime after the bones of the great Roman, which is either St. Peter or St. Paul, are found. In part two of the series (see 666) we followed an interesting lead suggested by “CJ” that the Aquila quake in Italy of April 2009 happened close enough to the discovery of bones purported to be relics of St. Paul to make him that great Roman, not St. Peter. Just a few months later scientific carbon dating proved that the bones hail from the times of St. Paul. The tomb under the altar of the Church of St. Paul just outside the Vatican walls is made of white marble. Pope Benedict XVI announced the discovery of the tomb on 12/6/06 (Twelve is 6 X 6) of the 6th day (666) in 2006 (or, 2 X 6 = 12). The quatrain is 66 of Century 6 (666). Of the great Roman with the Medusine device. The great Nostradamus scholar Edgar Leoni gives us the Latin Medusaeus, for Medusa whose serpent-topped head turned all onlookers to stone. Lee McCann believes it is an anagram Deus in Me the motto of Saint Peter. I would add that the name Peter, or pierre in French, means “stone.” The Medusa that can turn people into stone may be Nostradamus nasty description of the final Pope of the foretold Apocalypse who he infers elsewhere in is prophecies will be named Peter. The Medieval Irish prophet, St. Malachy, purportedly came to the same conclusion several hundred years before Nostradamus in his famous papal prophecies. In 1138, Malachy purportedly predicted the last pope of the Vatican during the apocalypse would be named Peter. Over the centuries, many believed the average life expectancy of pontiffs, placed the succession of the final pope on his list around, or shortly after, the dawning of the new millennium. These prophecies were rediscovered around 1595. They hint of 111 successors to St. Peter’s throne from the times of St. Malachy to the end times, each pontiff cryptically described by two-to-three word Latin mottoes. A paragraph plays coda describing the 112th and final pope of Judgment Day. These fascinating prophecies may have been written a half-a-century “after” Nostradamus’ quatrains by a man hiding his true identity under the nom-de-plume of the famous St. Malachy. Thirty-six popes were foretold in the list unto the Catholic apocalypse beyond 1595. The usual forgery should have fallen flat once hindsight was no longer aiding its phony prophet. Instead, the remaining mottoes’ accuracy beyond the potential forger’s publication is remarkably high. Read more of the complete details here: Last Pope. There is a reoccurring theme in Catholic eschatology. Nostradamus and other seers predict vast natural disasters and/or wars destined to unearth the tomb of Saint Peter in the ruins of the Vatican after a great flood and fire. Nostradamus in the following quatrain is less vague than 6 Q66 about which great Roman he is intending the apocalypse to uncover. Living closer to the end time might have sharpened his insight. Nostradamus wrote verse 6 Q66 in 1556. Verse 84 of Century 9 was set down one to two years later. Maybe his second glimpse of the future was clearer than the first. He might have seen the uncovering of St. Paul’s tomb and mistook that sepulcher for the first pope who will be named like the last, Peter. Clearly, the unearthing in the second prophecy alludes to a natural or man-made catastrophe. The quake is not in Aquila in 2009 but toppling the Vatican itself in the near future. The current Pope Benedict is the second-to-last pope in St. Malachy’s list. He is in his eighties; so a few years hence will come his successor, the Last Pope. There is an unwritten rule. No pope can use the name of the first Pope. Could Nostradamus have confused his “great Romans”? Could the last pope then be named “Paul” — Pope Paul VII? Time and events will soon answer that question, perhaps before 2015. I have often sensed over the decades that Nostradamus great Roman and Malachy’s Peter the Roman would rule during what I call the Roaring 2020s. This is the decade when unsustainable economic, social and ecological habits of humanity meet a catastrophic reckoning if destiny’s inclination does not change. This entry was posted in Catholic Apocalypse and tagged 111 Latin mottoes, Apocalypse, Apostasy, Aquila quake, Catholic Apocalypse, Deus in me, great Roman, Medusine, Nostradamus, Peter the Roman, Pope Benedict, St Malachy, St. Paul, St. Peter, Tomb of St. Paul, Tomb of St. Peter, Vatican scandal. Bookmark the permalink. Post a comment or leave a trackback: Trackback URL. O CONGRESSO NACIONAL BRASILEIRO foi vitima da violência dos sem terra. Foi invadido no dia 06 06 06. O 666 de NOSTRADAMUS. E as invasões e violência continuam até hoje com o beneplácito e apoio de verbas governamentais e verbas pecaminosas. Answer: It is not often I get to answer Portuguese comments, but I fail to understand what is the point of this rant here and in the next letter; or, what significance 6.6.06 should have for Brazil as there is no correlation. O anticristo nascera na própria igreja, o mst é filho da pastoral da terra, fruto do casamento desta com a igreja, não respeita propriedades, fruto do trabalho alheio, pratica sobretudo a violencia, furtos, roubo, invasões, extorções e et.. Sera que a igreja casou com o diabo e teve como filho a pastoral da terra, e esta como filho o movimento dos sem terra. os invasores residem na area do prata, mg e cidades vizinhas. Você tem de olhar além do seu nacionalismo para ler o que Nostradamus de fato disse. Além disso, quando Nostradamus escreve que ele é enfocado principalmente em como o futuro afeta a França.